We can't be in the theater every day of every month (at least not yet). That means that the Un-Scripted Theater Company space is available for rent. We're happy to accommodate you for rehearsals, one-time events, or runs of shows if we have the availability. 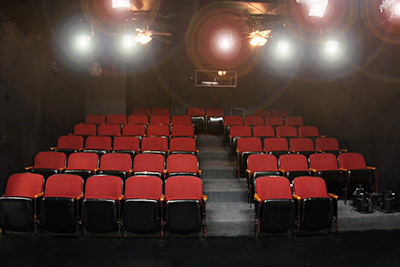 We have two primary spaces available: the 49-seat theater and the salon. There are two main types of events: behind-the-scenes stuff like rehearsals, classes and such, where it's you and your group; and public events like performances, readings, galas, book signings, etc. 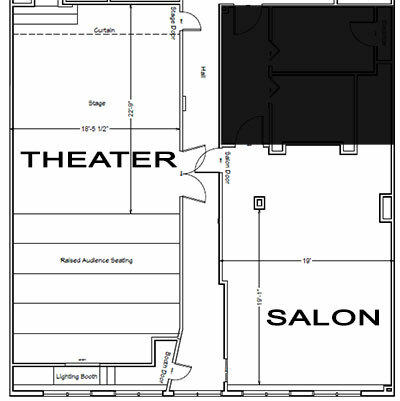 When you book the theater, you can also book the salon for use as a lobby/concessions space, if it is available, for an additional charge. Rehearsal: Time spent with a group learning and/or preparing for a performance where the members of the group are not paying to attend. Work lights only, in the theater. No stage lights without prior arrangement. Class: Time spent with a group learning and/or preparing for a performance where the members of the group have paid to attend. Everyone present participates (no audience). Work lights only in the theater. No stage lights without prior arrangement. Public Event: Any single performance or other function attended by non-performing participants, whether or not they have paid to attend. Stage lights and sound equipment may be used in the theater. Theater or Theater + Salon: 4 hours, doors unlocked to lights out/doors locked. Salon: 4 hours, doors unlocked to lights out/doors locked. * Please note that all Saturday night rentals have a hard stop of 9:50pm. ** Theater rental does NOT include use of the second floor lobby. That area belongs to our neighbors The Custom-Made Theater Company. If you need a ticket/concessions area before your show and during intermission, it is recommended that you rent both the Theater and Salon spaces. Otherwise, you MUST station a staff member in the second floor lobby to maintain quiet during Custom-Made performances. If you're interested in renting either or both spaces, fill out the form below. Also, be sure to check out some questions that WE frequently ask our renters.